This part contains a promoter that can be repressed by blue light (450nm). This promoter makes use of a blue light dependent DNA-binding protein, EL222. Irradiation by blue light of wavelength 450nm exposes the hitherto sequestered HTH, facilitating dimerization of EL222 and subsequent DNA binding. The repression is achieved by placing the DNA binding site of EL222 between the -35 and -10 hexamers of the consensus promoter in E. coli, creating the blue light repressible promoter PBLrep. 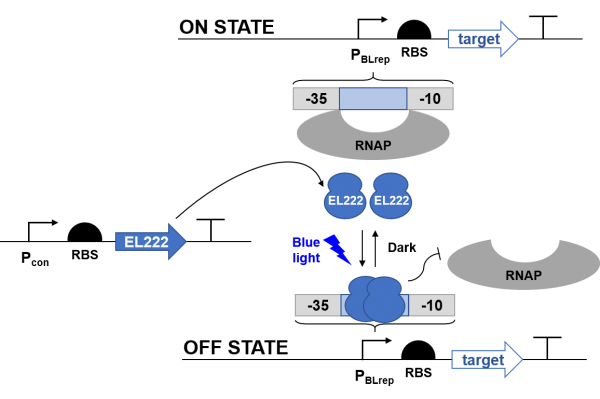 As a result, EL222 acts as a repressor, blocking the binding of RNA polymerase and repress gene expression in the presence of blue light. In the dark, RNA polymerase can now bind, and gene expression takes place. Originating from the marine bacterium Erythrobacter litoralis HTCC2594, EL222 is a photosensitive DNA binding protein, with a N-terminal light-oxygen-voltage (LOV) domain and a C-terminal helix-turn-helix (HTH) DNA binding domain. We aim to use this new part to improve the existing composite part. 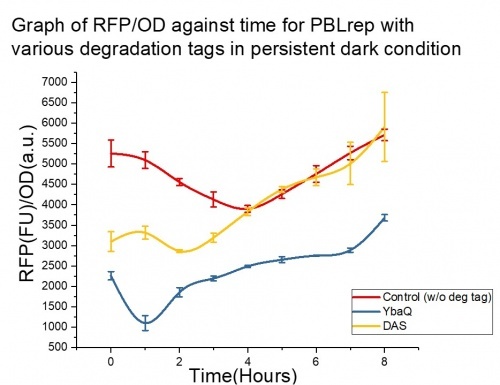 We hope to understand the dynamic characteristics of the blue light repressible promoter (PBLrep) better, so that we can use it to the application in our project. While the existing part has a bioreporter, the coding region of the bioreporter, LuxCDABE, has a large gene cluster (>5500bp), making it difficult for dynamic characterization due to its complexity. Furthermore, there is no characterisation data available on iGEM17_UCL’s part registry page for the blue light repressible promoter BBa_K2332019. Therefore, our team sought out to conduct a study on the PBLrep, by using a more suitable reporter. We altered the sequence of this composite part by replacing the LuxCDABE coding region with a commonly used reporter gene, red fluorescent protein (RFP, ~700bp), as well as tagging different degradation tags to the reporter gene to study the characteristics of this promoter. Furthermore, this new part has now wider applications compared to the previous part, such as an indicator. As the overall plasmid size is reduced significantly, it is now easier for users to co-transform it with other plasmids. To characterize this promoter, we used a common reporter gene, RFP (Red Fluorescence Protein). However, we quickly found that the expression of RFP cannot be regulated by this promoter, as its expression profile did not follow induction patterns. Therefore, we altered the sequence of the coding region to obtain a degradation rate optimal for this promoter to work, improving its functionality as now users can have better knowledge on how to use this promoter. 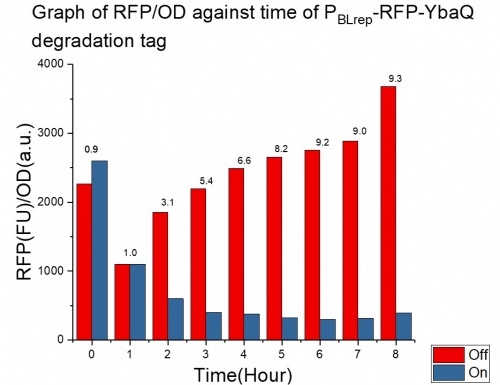 To achieve this, we attached RFP to different degradation tags. We did our characterization using various blue light on-off patterns. The PBLrep can be regarded as a constitutive promoter when blue light is absent, i.e. in dark, as dimerization of EL222 will not take place. All constructions and characterizations were done in E. coli TOP10, all plasmids contain kanamycin resistance. 3 composite parts were used: PBLrep-RFP (original part), PBLrep-RFP-DAS and PBLrep-RFP-YbaQ. All 3 were tested simultaneously in each experiment. Engineered cells were inoculated in 5mL of LB with kanamycin overnight. The next day, 5uL of cell culture was refreshed in 5mL of fresh LB with kanamycin until its OD reaches 0.05. At OD600 = 0.05, 1mL of cell culture was transferred to each well of a 12-well plate. Cells were then incubated in 37°C at 220 rpm, under different light conditions depending on the experimental setup. Fluorescence of the cells was measured at 1-hour intervals using BioTek Synergy H1 microplate reader. Cells were characterised in 12-well-plates in this experiment, and each sample is measured in triplicates. An example of a setup is as shown below. In this experiment, one setup was incubated under persistent blue light for 8 hours, while another setup was incubated in the dark (covered with black cloth) for the same duration. Our data suggests that using RFP solely as a reporter is unable to reflect the expected induction and repression activities of the promoter. As seen from the Figures 3a and 3b, fluorescence decreased from 0 to 4 hours in dark, and increased from 4 to 8 hours under blue light, which are completely opposite of what we expected. We speculated that this phenomenon to be due to the mismatch in rate of increase in OD600 and the degradation rate of RFP. 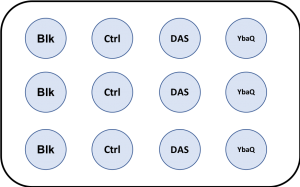 Hence, to alter the degradation rate of RFP, we attached 2 different degradation tags, YbaQ and DAS. Degradation tags are also referred to as degrons. They are either part of coding regions, or are added to them to direct their degradation by proteases. 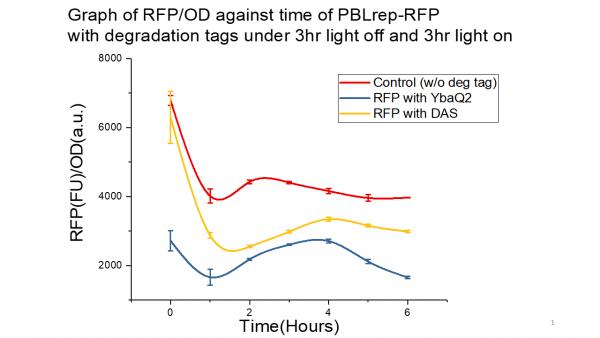 Experimental results show that RFP attached to YbaQ could reflect the expected induction and repression activities of PBLrep. 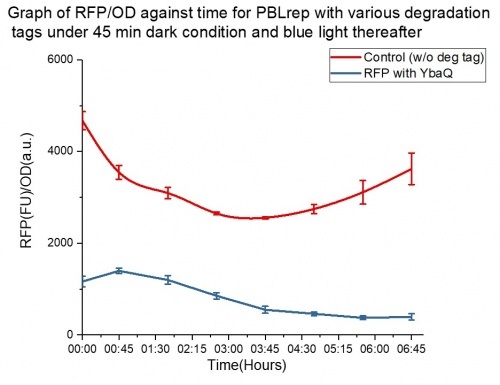 As shown in Figure 3a, RFP per OD increased steadily with time in dark, where repression is absent, while RFP/OD decreased exponentially with time under blue light as shown in Figure 3b. The high initial RFP/OD at 0 hour in Figure 3a can be explained by the low initial OD600 (0.05) and the presence of RFP in the system before the experiment commences. 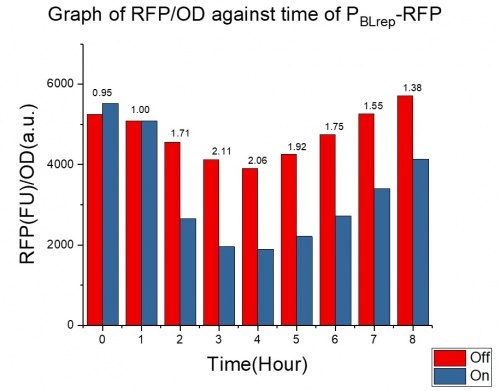 Figure 4a and 4b represent the comparison of RFP/OD of persistent light on and off conditions for PBLrep-RFP and PBLrep-RFP-YbaQ. There is a clear increasing trend for fold change for PBLrep-RFP-YbaQ, while fold change for PBLrep-RFP increased from 0 to 4 hour, then dropped from 4 to 8 hour. This characterisation experiment indicate to us that the degradation rate of RFP-YbaQ is required for this promoter to work as intended. 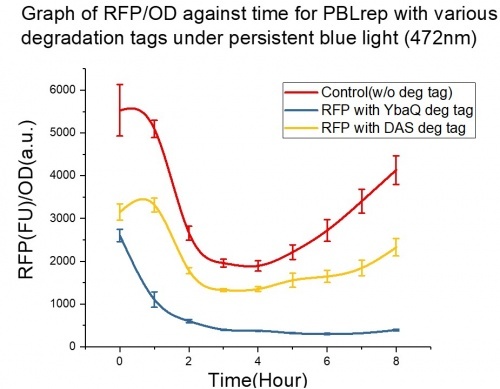 To verify that the degradation rate of RFP-YbaQ is indeed the most optimal rate for PBLrep to work, we carried out further characterisation experiments with different blue light on-off patterns. 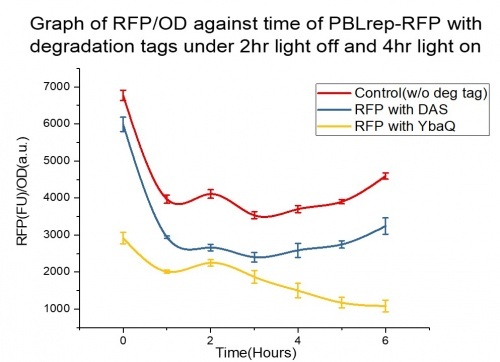 As observed from the graphs, even under different light on-off patterns, PBLrep-RFP-YbaQ still performed the best, showing clearer oscillation patterns with the absence and presence of light, while PBLrep with just RFP alone or with RFP-DAS showed relatively poor responses with the rate which light is being switch on and off. We also modelled the activity of the promoter and our model shows that for PBLrep to reflect better oscillation patterns, we should incubate the cell cultures in dark for 45 minutes, and under blue light for the remaining duration of the experiment. Our wetlab experimental data verified the recommendations made by our model. A dip is no longer observed at the start of the graph, and the change in RFP/OD could reflect our light on-off pattern. Our improvement in change the coding region sequence of a common reporter gene, RFP, by adding an additional sequence of a degradation tag, YbaQ, has allowed us to better understand how we can use this the blue light repressible promoter. From our characterization results, we therefore recommend future users to use a coding region with the same or similar degradation rate as RFP-YbaQ, in order to achieve the desired function of this promoter. This new part has hence improved the functionality of this promoter, which has helped us to be mindful when we select the genes we use under this promoter in our project.